Now we store, read, and playback our songs digitally on our computers, iPods, and other electronic devices. 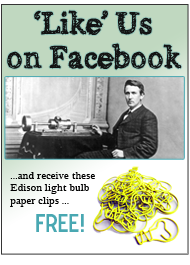 It all has come a long way since Edison first showed us how back in 1877. 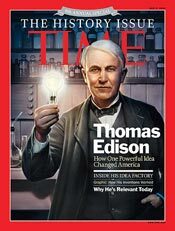 Think of the relevance of Edison today in the millions of people employed in this global business. In the U.S. alone, 2011 revenue from music sales is expected to exceed $17 billion; including revenues form physical performances, on-line and mobile downloads, and digital sales. Worldwide, that number is about $68 billion. Radio revenue [music sales, as inferred through advertising] is likely to add another $18 billion to the U.S. total. 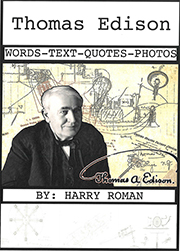 Like his motion picture industry, Edison not only pioneered the medium, he created both the movie studio and the recording studio at his legendary West Orange Labs. 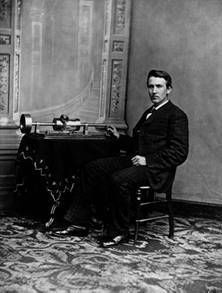 He invented the phonograph equipment, found the artists, recorded their music and marketed their work…a vertically integrated model still in use today. Today on the third floor of the newly renovated Edison Labs in West Orange, visitors can see the old recording studio, gaze at photos of the great artists who sang there and see the primitive, but effective hardware that started the world on its constantly evolving musical journey. Every generation has a unique sound to their music and probably always will. In a way, we can see Old Tom as a communication genius, giving us a variety of ways to express ourselves…first with great improvements to the telegraph, then an improved telephone, recorded sound and the movie industry. These innovations all involved something else…electricity….and of course, Edison invented the modern electric utility industry. Not bad for a guy from Milan, Ohio who never finished grammar school. Oh yes, almost forgot…Tom’s favorite song was “I’ll Take You Home Again Kathleen”. 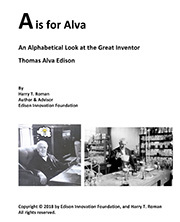 This entry was posted in Inventions Edison Would Love and tagged Edison Inventions, Edison Muckers, Edison Only Links, Edison’s Favorite Invention, innovation, invention, science, Thomas Alva Edison, thomas edison on June 29, 2011 by Edison Innovation Foundation.